Prime Minister Sheikh Hasina Sunday dedicated her present to the young generation for building their beautiful future assuring that her government will take all necessary steps for keeping pace with the changing world. “I’m dedicating my present to the young generation for building their beautiful and bright future … As long as we remain power we will take measures whatever necessary for keeping pace with changing world,” she said. The premier said this while formally launching the mobile number portability (MNP) services at a function at her official Ganabhaban residence here this morning. “I’m dedicating my present to the young generation who will take forward the country in future,” she said putting emphasis on maintaining pace of the country’s advancement. Minister for Post and Telecommunications and ICT Mostafa Jabbar presided over the function, while State Minister for ICT Division Junaid Ahmed Palak, Post and Telecommunications Secretary Shyam Sundar Shikdar also spoke on the occasion. Bangladesh Telecommunications Regulatory Commission (BTRC) Chairman Md Jahurul Haque delivered the welcome address, while PM’s Principal Secretary Md Nojibur Rahman moderated the function. Chairman of the Parliamentary Standing Committee on Post, Telecommunications and ICT Imran Ahmed, Nahim Razzak, MP, and high officials of the Prime Minister’s Office and mobile phone operators were present on the occasion. A video on the MNP services were screened at the function. country to make the services available. Describing the young generation as the biggest strength of the country, Sheikh Hasina said Bangladesh will be developed further if they are groomed up properly. “Once the country was under the era of darkness, but now the country is advancing towards light. The young generation will get the path of light if we grow them up properly,” she said. The prime minister asked the young generation to be habituated to using technologies, saying that the technologies are frequently changing in the world. “With the passing of days, new technologies are innovated and the young generation will have to be habituated to using the technologies to move keeping pace with modern world,” she said. Urging all to pay tax, Sheikh Hasina said how the country will be developed if demands for reducing tax are made frequently. “We’ve been able to increase budget seven times, we are constructing roads and bridges and implementing Digital Bangladesh with our own funding. “But, there was a time, we were used to beg hands and to be dependent on others …that days have gone. We’ve to retain this honour,” she added. The prime minister said the government is making strides to build Bangladesh as a self-dependent one. “We are working untiringly to achieve the goal,” she said. Sheikh Hasina, however, said she has nothing to do if the finance minister waves tax. “But we’ll be able to keep up development spree if the people pay tax,” she said. She said Bangladesh has now been transformed into a digital country due to various steps of her government in the last 10 years. The prime minister said her government made television, telephone, bank and insurance open in private sector to generate more employment in the country. She said there was only one television (BTV) and only radio, but now 44 TV channels got approval from the government and of them, 32 went into operation. “Though we’ve given approval to the TV channels and digitised the country, we (the government) are the most sufferers as so much criticism against the government takes place there,” she said. “But whatever criticism is made there, we were able to create employment for the young generation,” she added. 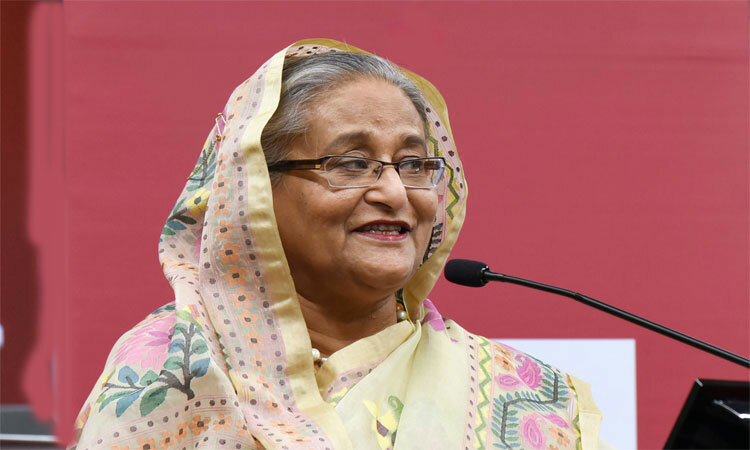 Highlighting her government’s steps for the development of telecommunication and ICT sectors, Sheikh Hasina said her government in 1996 broke the monopoly of a mobile phone company by issuing licences to three more companies. “We had waved tax on computer and its accessories massively to make the use of computer popular during the period,” she said. hi-tech parks went into operation,” she said. Bangladesh Telecommunication Regulatory Commission (BTRC) announced the introduction of the MNP services at a press conference at its office here on October 1. The services have opened up the users’ freedom of choice in switching to any network, retaining the existing number unchanged, which was not possible earlier for the hassle of changing number. The regulator assigned Infozillion Teletech BD, a consortium of Infozillion BD Limited, and Teletech DOO, Slovenia, through issuing license in November last year to offer the MNP service. It was directed to run operation within 180 days of getting the license, but failed to comply with the order for the non-compliance of mobile phone operators. Infozillion Teletech BD managing director Mabroor Hossain said as per the BTRC rules, mobile phone users must collect new SIMs from the customer care centres of the desired operator. “Within a particular time, the new SIM card would be activated,” he said. Mabroor said they have taken an initiative to complete the porting within 24 hours for prepaid users. picture during the collection of new SIM. If any user again wants to change operator, he/she has to wait 90 days, added Zulfikar.